Dry / Mature Skin: This extraordinarily effective moisturiser instantly bonds with the skin to provide immediate revitalisation. Japanese satsuma mandarin extract lightens skin and reduces sunspots. Glycoproteins stimulate cell growth for long-term reversal of damage caused by aging and environmental pollution. 71% of users notice significant reduction of age spots after 6 weeks. Aloe barbadensis (aloe vera) leaf juice*, helianthus annuus (sunflower) seed oil*, cetearyl olivate, sorbitan olivate, cetearyl alcohol, cetearyl glucoside, caprylic/capric triglyceride, glycerine*, reticulata blanco var. unshiu (citrus unshiu) peel extract, butyrospermum parkii (shea) butter*, sodium hyaluronate, xylitylglucoside, anhydroxylitol, xylitol, tilia cordata (linden) flower extract*, sambucus nigra (elder) flower extract*, hypericum perforatum (st. john`s wort) extract*, aniba roseodora (rosewood) wood extract, tilia cordata (linden) blossom oil*, cananga odorata (ylang ylang) flower oil*, bisabolol, xanthan gum, rosmarinus officinalis (rosemary) extract*, populus tremuloides (aspen) bark extract. 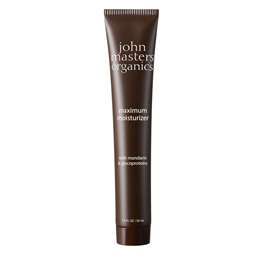 Apply to the face after cleansing and toning and gently massage into skin. Japanese satsuma mandarin extract - reduces pigmentation of age spots; lightens skin creating luminescence. Glycoproteins - derived from potato, stimulates remarkable cell growth, resulting in younger-looking skin. Brewer`s yeast - helps the skin to breathe and rejuvenate itself. Xylitylglucoside (wheat derived) - dramatically increases the water content of the skin. Below are reviews of Mandarin Maximum Moisture - Moisturiser - 30ml by bodykind customers. If you have tried this product we'd love to hear what you think so please leave a review. Mandarin Maximum Moisture is an extraordinarily effective moisturiser that instantly bonds with the skin to provide immediate revitalisation.